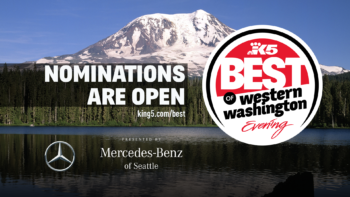 “Nominations are open for 2018’s Best of Western Washington! You can nominate ONE place (the BEST place) in each category. Every nomination enters you for a chance to win this year’s grand prize: $5,000 cash *or* a six-month lease on new Mercedes-Benz vehicle! “Nominations have been extended through the weekend! They now close Sun, 9/16. Voting starts 9/24. Only the TOP 5 NOMINEES will appear on the final ballot. “We’ve had to cut down the number of categories in the contest this year. (We know! We’re sad, too.) If your category isn’t on the ballot, fear not! It may pop up in another voting round in 2018. “Text the word BEST to 33438 on your mobile phone to sign up for daily voting notifications,” from KING-TV 5, Seattle.